I was looking for a side dish for my texmex style turkey dinner and I had been wanting to try making a stuffing for a while so I combined the two and made a texmex style cornbread stuffing. For the corn bread I used the cranberry corn bread that I had made the day before. 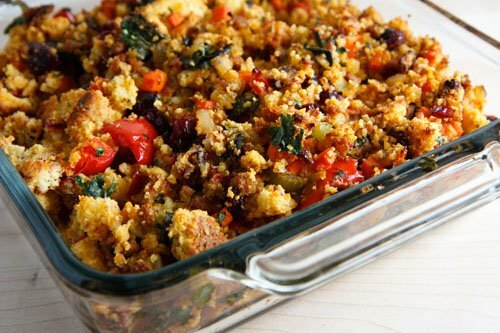 I had seen a lot of more standard stuffing recipes use sausage and I thought that adding spicy chorizo sausage to the corn bread stuffing would be a good idea. I then added some more texmex flavours like chilies, cumin and cilantro. I made it more ‘holiday’ like by adding some dried cranberries in addition to the cranberries that were already in the corn bread. Since I was only cooking a turkey breast I could not actually stuff the stuffing so I cooked it in a baking pan. The texmex corn bread stuffing with chorizo turned out really well. The slightly sweet, moist, and coarsely crumbly corn bread worked well in the spicy stuffing. The stuffing was nice and moist and tasty and had just the right combination of sweet and spicy. It was a great side for the maple and chipotle turkey breast and it was even better with some maple and chipotle gravy and jalapeno cranberry sauce on the fork as well. Brown the sausage in a pan and set aside. Add the cumin and chili powder and saute until fragrant, about a minute. Add the onion, celery, carrot, red pepper, jalapeno and oregano and saute until tender, about 8 minutes. Add the garlic and saute for another minute or two. Add the bourbon and deglaze the pan and let it evaporate. Place the chorizo, vegetables, roasted poblanos, corn bread, cilantro and cranberries in a bowl. Moisten with the chicken stock and season with salt and pepper. Pour the mixture into an 8 inch square baking pan. Bake covered in a preheated 350F/180C oven for 30 minutes. That is a great idea! I love the colours and the chorizo. Sounds delicious and looks awesome! Am playing catch up here this morning Kevin. Your Christmas feast looks decidely delicious!!! Am bookmarking this for next year! I have some leftover corn bread myself. This is a good idea to use it up. What a wonderful recipe – I love this idea! Kevin, this looks just fantastic! Look very moist and delicious with chorizo sausages, Kevin. What a festive dish, it looks delicious! I love stuffing, this one sounds great and looks really good too. Chorizo and cornbread… sounds fantastic! There is absolutely no way that this can’t be amazing. This does sound like the perfect side dish for your turkey! This would be a great side dish for my mexicali meat loaf, which is also nice and spicy. I love the combination of cornbread and sausage — it’s the basis of my family’s favorite Thanksgiving turkey stuffing, too. This looks beautiful and sounds delicious. I would love to try this. Wow, these colours are gonna make a very sad person very happy! I just drooled over a series of your posts! Everything is looking great on here!! I love this stuffing, and the brussel sprouts look great too! What a different stuffing. I’d love to taste this.